Dogs know when we are feeling down. They love it when we are happy and seeking friendship and fun, and they understand when we are feeling sad and desperate. This book presents a series of real-life tales of the positive effects dogs have had on people at the end of their lives, chronicling the visits by two therapy dogs, Woody and Katie, to patients in a south Florida hospice facility. 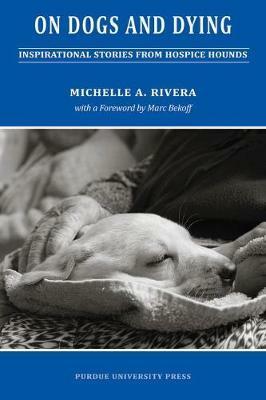 Through twenty-one stories, infused with humour amidst the sadness, Michelle Rivera, an experienced animal therapist, explores the many ways in which animals can ease human suffering. Her book begins with the deeply personal story of her own mother Katherine's illness and dying appeal to have the company of a dog and proceeds to tell the stories of patients young and old who the author was inspired to visit with her 'hospice hounds'. As well as demonstrating many of the techniques of animal therapy, Rivera argues powerfully that not allowing pets in health care facilities is a counterproductive policy that deprives patients of comfort at the time they need it most. Some of the stories were previously published in ""Hospice Hounds"" (2001), but the author has substantially expanded her introduction and added an invaluable final section that gives practical tips on training and certifying your dog to be a therapy animal. Michelle Rivera is the author of several previous books including Do Dogs Have Belly Buttons? She has two Certified Delta Society Therapy Dogs: Murphy, a golden retriever, and Tabitha, a standard poodle; she also has three cats. All are rescued animals. Michelle is also a registered humane educator with the Palm Beach County School District and the founder and executive director of her own non-profit humane education organization, Animals 101, Inc.